Sales is not about convincing people who do not want your service to buy it. Sales is about finding the people who do want your service and letting them buy it. Odd that this premise is so overlooked in business. I’ve worked with 100’s of small and medium business owners or senior managers who really didn’t get this. And it can be a fatal flaw to a company. There is a complete misunderstanding of what a salesperson/group/ division is capable of. I’ve worked with owners of multimillion dollar companies, who really think the simple act of hiring a professional sales person means that sales person should now be able to convert most (or at least a decent amount) of prospects by using the magic they have learned throughout their career, no matter how good a fit the service or product is, no matter the position of the product in the marketplace, no matter the branding of the product. In the mind of the less informed, a sales rep can sell anything. Add to that the natural and common tendency for owners to have a higher regard for their offering than the market itself, as well as the common optimistic early sales projections and outlook communicated by the new sales force, and you have a disaster waiting to happen. I should note that I have worked with sales people who can sell anything, but they are very rare, and they generally produce much lower customer loyalty. Perhaps these are the salespeople owners are thinking of when their expectations are that a “sales person” can sell anything. The solution is a well thought out sales and marketing assessment before you go and buy the farm. And this is tricky, because the reality is marketing is primarily responsible for identifying the target market (People who will like your service) finding out how to reach them , and then attracting them to your sales group or funnel. Yet most companies I have worked with don’t have a budget or an understanding of how these two key disciplines must work together to achieve success. So they put all their dollars in one or the other, or severely under budget one. So if you buy into this premise, the fundamental success of sales for you company starts with product development. A good sales rep can’t sell a product that is hard to use, or poorly designed. A good sales rep can sell a product that is easy to use, and has a clear advantage for their target market. So working relentlessly on improving what you sell, will do more for driving sales than anything else you can do. After that, you must have a marketing machine to get the service in view of the right buyers. Once that is accomplished, sales comes into play. Sales is the last piece of the sales process, following product development and improvement and then marketing. So if you’re struggling with sales, perhaps where you should be looking for answers is in your product or service offering, or are you asking your salesperson to be both your marketing department and sales department. Building a Lead Generation Program Is Easy (NOT). So… I’m asked all the time how to build sales for a business. Should I do Social Media, SEO, Advertising, Direct sales, all of that. I think the first point to start with any “sales” program is the understanding of one very important principle. So to get to that lets start with this question which is this: Sales starts with and goes no where without what? There are many good answers to this, you might say..
– A great product, – A sales person, – An offer, – Marketing dollars, and on and on. But the pragmatic answer is this: Sales go nowhere without “leads”. A lead is a business or person who has been qualified as a prospect AND expressed interest in what ever it is you sale. Now here is the second principle you must understand….Lead Generation is hard, expensive, and can be very painful. That’s why “inbound Marketing” has become such a big tactic. Inbound marketing whispers the promise of easy leads being sent to your inbox, ready for your sales rep to close. The mistake in this concept is that Inbound Marketing is HARD, expensive and can be painful. like any other form of lead generation, it just has a prettier face. So if you want to build sales, you have to understand, it’s going to either cost money, or it’s going to take all your time (if you’re a small company). How much money depends on your service or product, and market. To get the picture on how you should budget (or spend) on sales (and 30% to 50% of that should be in lead generation) you need to understand there are different type sales strategies and customers. Depending on your growth strategy, and your tactics have a everything to do with the cost. If you’re in a sustain mode, relying on referrals and luck, then your budget is tiny because it costs very little to acquire referred customers. If you want new “open market” customers, that’s a completely new game. And these new customers are your growth group. You have to sell to them in a completely different way. They don’t know you, so you have to establish trust in the relationship. That takes time and money. So here is a simple formula you might consider. A new market customer will cost you at least 15% of your Gross revenue. So if you sell $2500. Web sites, a new market customer will cost $325. Also understand that that’s 15% of a new sale, not 15% of your gross revenue. If your revenue is evenly split between referred customers and open market customers (a nice healthy mix), your budget is 7.5% of all revenue. That’s why the first few years of a business is so tough! Your cost of sale is twice to three times what your established competitions is. The thing that really stops most companies from investing that 15% is the fact that it’s money up front, and it takes time to get the return. If you want 10 new customers in a quarter (or a day, its all just math) you are going to have to invest $3250.00 , it may take 6 months to see the total first stage results (First stage is the original prospect buys, second stage is when they refer others). So if you have an ongoing program, you’re into the budget $3250 time 6 months before the first months return is final. Ouch! That’s why most start up sales programs don’t have a positive return until the 9th month. if you do it wrong (which is easy to do) it’s throwing your money away. So you can start to see the pain… it’s hard, and it’s temporarily expensive. Not only that, but if you do it wrong (which is easy to do) it’s throwing your money away. And the first way to do it wrong is by NOT focusing on lead generation first. For small companies without a sales department or person, you are going to have to outsource your lead generation. Sorry, no choice if you want to grow. You’re also going to need to put some dollars into it. So if you don’t have 15% of the expected new revenue ready to spend, your not ready. If you want to add $1,000,000.00 in sales in the next 3 to 12 months, you need $150,000.00 in funds. Sorry, that’s the truth. And of that 30% to 50% should be in lead generation. The bottom line in a successful lead generation campaign is this: If you don’t have the money, it’s not going to work 95% of the time. So if you do have the money or time where should you spend it for the best return on Investment? Well, that’s a whole new subject, which I will write about soon. But, here’s a big hint, you should start with Lead Generation. Social media campaigns managed by a professional firm with a great track record. And a bunch of other tactics. All of which, falls under business development, because any of those tactics have to be implemented well, and will need to be integrated with other parts of your business to be successful. That’s what I do with companies. What I call business development. And that starts with assessing budgets, strategies and tactics to be uses, and finding decent measurement metrics and tools. It’s hard, it’s expensive, and it’s painful at times. It’s also the way 95% of businesses grow, and owners become wealthy. Your choice is to recognize the challenges, and do nothing, or boldly go where few small businesses go, which is find the money and courage to grow. Monthly SEO Check and Web Presence maintenance. From time to time we are asked what we do monthly to check on a web sites SEO status. So, instead of boring you with a narrative I thought we would just post some of the instructions I give to our SEO people. It’s in no way completely inclusive, but if you want to D.I.Y this is a good guide. On Site:Home Page and Main keyword page. Does one of the two contain a local intent keyword if a local company. Find the meta tags by right clicking on a blank part of the page. Click on “page source” A new page will open. – Does the home page have a G+ icon that goes to the business G+ profile? Mention that when the Business profile is complete, they should add the G+ badge to their home page. Instructions are in the G+ business page information. – Does the site have good quality content? Internal pages should be added from time to time, and a page from the main navigation should have at least 700 + words. The information should be useful and well written. – Does the site have a Blog? If yes, is there new valuable content on the blog? Are blog titles used that will be easy for the search engines to identify what the blog post is about. Are they using a SEO plug in for a word press blog. – No blog? Add one. They can pay content writers to produce blogs. (average cost $70 to $129.00) or write their own. Site Structure: Is the navigation clear and using a silo system for main search topics ? Site Load Time:Does the site load in an acceptable time. Check GWT for speed test. Does the site clearly display the local businesses Name address and phone number on the homepage and contact form. Suggest they use http://schema.org mark up for their address. Their web master can do this very quickly. If its a local company are they using a local number? Add one if they are using a n 800 number. Google Web Master: Is there a current site map on G.A.? Search for business name on Google. Check all first page results for any positive or negative reviews. What ever review sites show up (Google, Yelp, Youtube) you should encourage the web owner to ask for more positive reviews on those sites and make them aware of any non positive mentions or reviews. MOZ Rankings: Go to MOZ.com and log in. Run an open explorer report on the main URL. Note and communicate the Page Authority, and Number of links. Down load a monthly back link report. Go to moz.com open Site Explorer. Add top three competitors to “compare link Metrics ”Copy report to client. Run Open Site Explorer for the top three sites. Look for linking opportunities. Provide a brief summary of work completed this month or period. Want to learn more about Google Plus and promoting your business? 1.2 Million Dollars in New Leads, With 1 Page and No Off Site SEO. I know, SEO is a very difficult to understand these days… but we all must conceed there is “something” that determines where Google and other search engines place a result from a search query. Understanding how that works (or at least some of how that works) is what a good search engine optimization company does. The process of understanding that is to watch carefully how certain pages move up and down in the search engine results for certain specific keywords. And when you see positive movement, figuring out what may have caused it. This is where it gets really tricky, especially for an SEO who is actively working on marketing a clients website, because in my humble opinion, Google does some very interested things concerning “timing” of search rankings. The short version is, what you see happening today may only be temporary, and based on Google wanting you to think what you did in the last few weeks, or month may have been the cause of the change, when, the truth is, they’re just waiting to see if you react to a positive change by doing more of what you did, and then seeing that you do, they ZAP your silly little SEO process and drop your rankings like a bowling pin going down for a 7-2 spare pick up. It’s the typical “Google is smarter than you syndrum”. Look,I am pretty sure they only hire people with an IQ higher than 195, and thats for part time positions. You are NOT going to outsmart them… really. Go ahead.. try. So what do you do? Well, doing nothing with a pages SEO is a great process. You see , once you get past the basic’s of some good quality promotion of a site, and making sure the site has decent if not great on page optimization, the rest falls into the hands of the audience. The people who search will have a much larger impact on your pages ranking than any backlinking or SEO wizardry you may do. Here is my example. This page is ranked very highly in about 7 different city searches for the major keyword. In other words, if I set my browser to Denver, or one of the major suburbs around denver, and type in the keyword, with no location intent (a city or zip) this page is in the top 2. That by itself doesn’t mean much, but it also brings in a huge amount of the right traffic for the client. This year they are getting about two proposals a month from the page, with an average value of 50K. There aren’t a bunch of backlinks to the page. We haven’t done any SEO to the page except the concept, and the onsite work… meaning just the basics.. title tags and such. So why does this page rank so well? People LOVE it! The click through rate is huge, and the time on page is excellent. 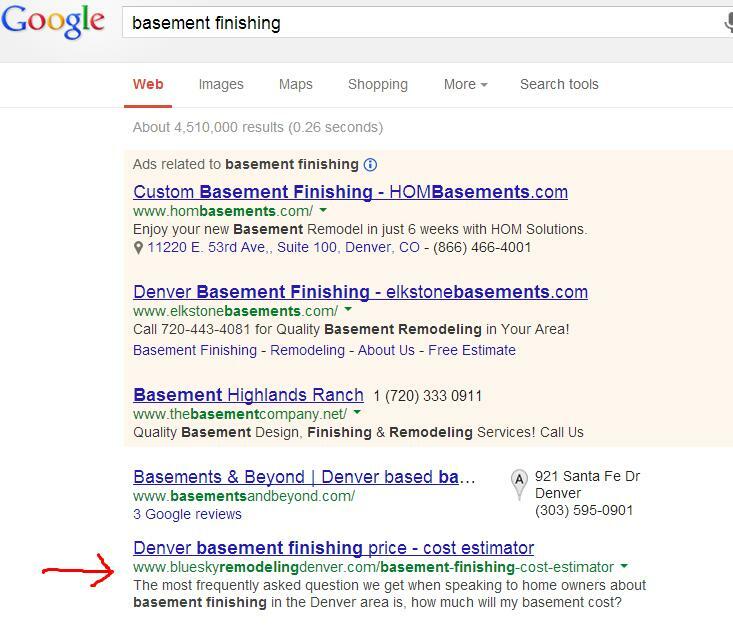 This page is so popular that I know of at least two other competitors to the company that use it to show their prospects what a basement finish might cost. Now thats a great testimonial. So what’s the most important element to SEO? Popularity of the page you build. (past the basics,. aAnd, isn’t that exactly the way it should be? I told you those Google people were smart. This blog was posted a while back, and I thought I would update it today. So much has changed on G+ that the truth is you really shouldn’t try to “optimize” your G+ profile or posts much at all. The value of G+ posts on SEO is highly overstated, as a stand alone practice. USe your G+ profile like any other about you page. I had a discussion with Stephan Hovnanian ( https://plus.google.com/105076725141939280120/about , who is someone you might want to follow by the way on Google Plus) about optimizing your Google plus profile. Here’s the deal in my opinion. People are always talking about “optimizing” your profile, when that’s a long term losing game. Your profile page is like a scrolling screen. Google probably see’s every post you make as a new page, and every time you make another post about cute cats, or your amazing insight into… whatever… every post you made previously gets pushed down the page (or buried under more stuff). That causes your links in those posts to gradually diminish in value, both from a readership standpoint (come on, when was the last time you read more than 3 or 4 of the most current posts on a profile page) but also from a SEO value. Any other social directories you participate in. I bet you can think of many more. So what happens if I do all this you ask? Well, all the things you hope will happen as far as your sites, blogs and authority will get better. Needless to say, if you are going to start paying more attention to your About page, please read up on all of the good info out there on how to build a good one. And trust me, it can be a very powerful page for your internet visibility, and therefore every page you have a link to on that page.. So, if someone were to ask me, would you rather have a link to your site in a post on a profile which slowly just loses it’s value as it sinks deeper and deeper into the G+ (or Facebook, or whatever) catalog of millions of posts that are made every day, or on an About page, which never moves down into that cavernous digital vault of old posts. Which makes more sense? A collection of great articles and Blogs over the last few months. When I read an exceptional blog I put it in my pocket to read or reference later. I thought it might be a good idea to share some of the better ones here. Some are SEO related, some are content marketing (same thing right?) and then just good marketing. Just one of the best and simple SEO articles in years. Can it really be as simple as he makes it sound? Yes. Read this if you get stuck on an SEO project. Well, more like content distribution. If you want some tips on how and where to publish your blog, Mike Allton is the guy to read. If you don’t have one, this is really great. From beginners to professionals you should find some great ideas here, or at least a nice list to work from and cross check. We all want them, but how do you build a really strong referral group? This article has some powerful ideas if you are willing to work at it. In my experience, it’s one of the better tactics you should use. Stop advertising and get on the referral ban wagon. And here is one for all of us non tech types who want to do a startup. I loved this article. If you have ever felt a bit frustrated because it seems like all of the successful startups are tech driven, read this. Great advice for all of the non tech entrepreneurs. Enjoy, and let me know what you think about these articles. Google Plus for SEO. A Fellini Movie Set in Algorithms. Google + for SEO. A Fellini Movie Set in Algorithms. SEO practitioners are, by their very nature, curious. I think this is the main reason they continue to research and track and measure in a business area where there are no “right answers, or at least, not that stay right for very long. SEO is a changing landscape like no other I’ve experienced in business. It’s more analogous to a game of chess where the rules change every three moves. The queen becomes the pawn, the pawn becomes a soccer ball. Its a Fellini movie set in algorithms. According to wikipedia.org “Curiosity killed the cat is a proverb used to warn of the dangers of unnecessary investigation or experimentation. An easier definition of the phrase curiosity killed the cat would be that being curious can sometimes lead to trouble”. As SEO companies we all understand that we ultimately are lead to trouble when we become completely focused on the newest SEO rage, currently the Google plus platform. 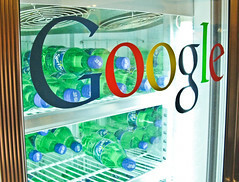 It seems like every 30 minutes there is a new post (on G+) about the miracles of G+ and SEO. It’s a mass conscientious thing. One well known SEO makes a post or blog stating G+ has potential, and then every young SEO gun slinger wants to prove it is so. The young guns do a lot of the early testing, and when one or two stumble upon some curious correlation between say… the alt tag in your g+ profile picture and one high ranking low competition keyword, the content marketing crowd goes to work flaming the fires of curiosity, all for the benefit of traffic, not truth. Even if all of this discourse on Google plus for SEO has a substantial amount of truth in it, the fact remains, (and this is where so many of us fail, and get “killed”), there is no one historic case you can point out where an SEO gold mine platform, wasn’t converted conveniently by Google into just another web page over time, leaving those who invested too heavily in it, poorer than when they began. Can any one who has been working in the SEO community for more than a few years, honestly say, that even IF G+ is the greatest SEO platform in the world today, that in a blink of an eye, it won’t just become another web page or site, like any other, at any moment. We should be curious… but diverse. We should view all new trends and correlations with historical perspective, and not let the current mania du jour form our operating principles. So, I like any professional give the standard SEO guy answer, let me look at it. The first tactic I use to figure out what is going wrong in a Local Business ranking is to see where they are currently listing online and what those listings have in them. Specifically do the sites they are currently listed on have the correct information on the company’s name, address, phone number, and categories. In this case the potential client had a real mess going on. One of his “SEO” companies had built two different web sites with two different URLs, both with different phone numbers (for tracking I assume) and their correct company name and physical address. They had also listed these sites with the wrong information in many of the standard local directories everyone uses, including Google of course. They also had a HomeAdvisor listing with a tracking number, and…. they even had several directories where someone years ago had listed their home phone number and address before they had a nice big office in a nice big office building. All of this created a very confused Google. Google loves consistent information about your company. They are robots… they have a mission, and the first mission is to collect information on your business name, address, phone and URL. If they see different versions, they completely lose their confidence, and push your website rankings way down, so they don’t have to deal with it. I am not joking. These robots are cowards. The reality was they didn’t need SEO, they needed an Internet Janitor to clean up a horrible listings mess. And this is where so many SEO’s and businesses get it all wrong, from the very beginning. They start with checking back link reports. Backlink reports will not show you the inconsistent listing issue. You must search like a human (hey… that sounds like a song title… “Search like a human”), anyway. Go to Google and type in the Company name. Now go to every site that shows up for that company and see if it has the right Name, Phone, Address and URL. I have seen rankings plummet when a business uses DEX advertising with a call tracking number. Dex will publish the company name, address and the tracking number, all over local directors to encourage salespeople to call the client, so DEX can make a dollar of two on the call. A confused search engine is a big problem. And when Google see’s different information for the same company, they don’t call you and ask, because they are robots, they just bury your rankings because robots have no feelings. In many cases, the fastest way to get your sites rankings up is to fix any old, incorrect, or in any way inconsistent listings that exist online today. Most businesses can do this on their own by contacting each site that needs to be corrected. In some cases, it’s really hard, so if you can clean up most of them, you probably have done enough to fix the problem. Or, you can hire an Internet janitorial firm (like us) and we will do it for you. The main thing is Don’t continue to pay for SEO until this is completed. You may be surprised to see your site appearing on the first page for your important services after a good clean up. Not sure if this is your issue on rankings? See that click to make an appointment link on the top of the page, it goes directly to my inbox. Feel free to use it, and I can tell you in 5 minutes if you have issues. Top Five Local SEO Ranking Killers. Sometimes it’s more important to know what will kill your rankings than what will help your local rankings. 1.) Inconsistent Name , Address or Phone, on different web sites. Clean up old listings that have the old address by searching that address in Google, and then contacting each site and up dating it to the new address. Same thing for a changed phone number. Google the number to see what sites have it listed and get it changed or deleted, and if for some odd reason (and we have seen this several times) you have a different URL, with a different phone number, please remove the site! As a side note make sure your business listings are consistent in every directory. Same exact name, same exact phone number and same exact address. I don’t know why I see so many local web sites with no address listed. I assume it’s because they are home based. In most cases, you should either list your home address, or get an office. You can hide your home address on Google Places (as a matter of fact its part of their terms of service that if you are home based, to click do not show my address). Any way, if its really important that you don’t want your prospects to know you are working in your pajama’s, as if they won’t figure it out anyway, your not going to have good rankings. And if you had good rankings you could probably afford the little office up the street. LIST YOUR ADDRESS, PHONE and Company name on the home page. It takes an hour or two to list your company in the important local directories. Go to getlisted.org (It’s free and a great resource). List your business with most of the directories they recommend. There is some disagreement in the SEO world about how damaging this is. I have had several discussions with some of the countries best Local Maps and Local SEO experts , most notably Mike Blumenthal (see his blog here http://blumenthals.com/blog/ and follow it if you are a serious local SEO student), But they all do agree that after looking at some case studies, a DEX tracking number published on multiple different local directories is not good for your rankings. I would take it a bit further, IT IS A COMPLETE RANKING KILLER for Google Places. It’s the same thing as having different phone numbers published on different web sites. It confuses the Robots, and then you are in rankings trouble. 5.) No Meta Titles or descriptions or poorly written ones. So your nephew did your web site when he was studying web design… nice! The most important part of your web site for SEO, is your meta title. If you don’t know what that is (and you can not see it BTW on your site) call a web design firm or SEO and ask them to check. If its your company name, your hurting your rankings, unless you want to rank for people who all ready know who you are). Have a pro take a look at your meta tags, and your on site SEO in general while they are there. This one may cost you a few hundred dollars on up to fix (including the on Site SEO changes), and yes 90% of the web design firms you speak with with tell you to build a new site (and maybe you should), but, just get the tags right to start! These are the top 5 ranking killers for Local sites that we have seen. And any one of them can keep your site from being well ranked. It’s worth the time to have a company ( like us) fix this issues if Search Engine traffic is important. 13 Good Luck Tactics for your SEO program. We all know SEO is hard work, and lot’s of research, but as in anything, some good luck is always welcome. Here are the top 13 tatctics to attract good luck for your SEO. 1.) Type in your search term every hour, click on your listing, stay on home page AT LEAST 45 seconds. Click onto another page. Stay there as you hold your breath to the count of 10. 2.) Do this again from another IP address, but stick your tongue out as you hold your breath. 4.) Go to Rand Fishkin’s wife’s blog and make a comment about how smart her husband is. http://www.everywhereist.com/ . Buy the way, it’s a great blog! 5.) Never, ever mention SEO in any article or published piece that in any way can be associated with you or a client. 6.) State on your site you do not list clients because you don’t want Google to know who they are. 8.) Always use broad match in your Adwords… and spend too much. 9.) Do a blog weekly on how great Google Plus is. Extra credit if you bash facebook or microsoft. (I find that pretty easy to do). 11.) Carry a lucky mouse foot around in your pocket with your keyword and site written on it. 12.) Brag about your new Chromebook on your Facebook page and refer them to the post you made about it on your Google + page. Your Company name | Popular in your keyword 100 times a day. Using all of these on a consistent basis will do wonders for your rankings. Do you have any you can add? These are just some that work for us.. What good luck tactics have you found work?